Entero Health Pro supports long-term intestinal health in dogs and cats and may help manage recurring diarrhea. Over time, Entero Health Pro helps normalize bowel function by supporting the protective layers of the GI tract. 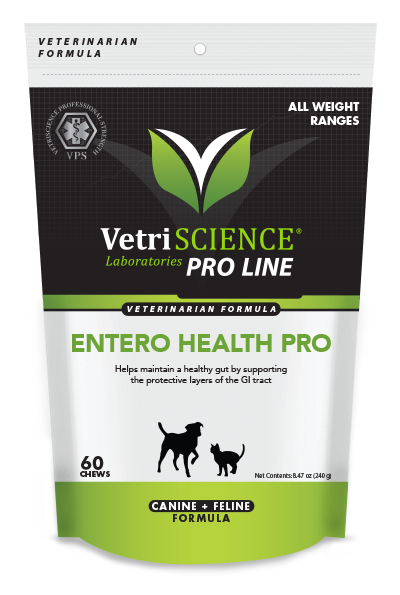 Entero Health Pro supports long-term intestinal health in dogs and cats and may help manage recurring diarrhea. 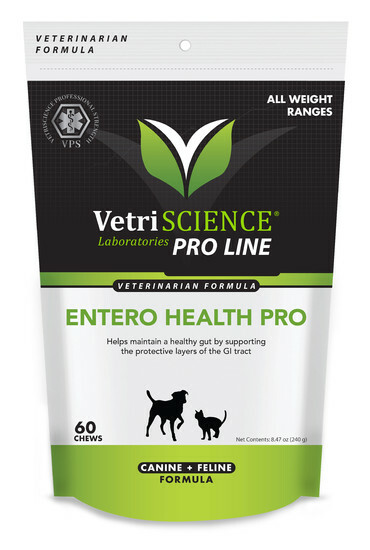 VetriScience Laboratories Entero Health Pro is designed specifically to address the needs of pets that struggle with regular digestive health issues that, over the long term, can be the precursor of many other health issues. The ingredients in Entero Health Pro help to maintain the mucosal lining of the intestinal tract which in turn allows for better absorption of nutrients, less susceptibility to irritation, fewer instances of dehydration and a smoother process for the body to expel waste. Our featured ingredient, Entero-Chronic®, is a clinically researched blend of four ingredients. Working in a multimodal fashion, these ingredients support a healthy gut while zinc carnosine and slippery elm bark support and soothe intestinal membranes. A healthy GI tract may help alleviate common digestive distress that can be caused by illness, stress, food sensitivity and environmental conditions. 0-30 lbs: 1 chew daily. 61+ lbs: 3 chews daily. All weight ranges: ½ chew daily. For best results, cut chew to halve. acid, soy lecithin, sweet potato powder, vegetable oil, water.